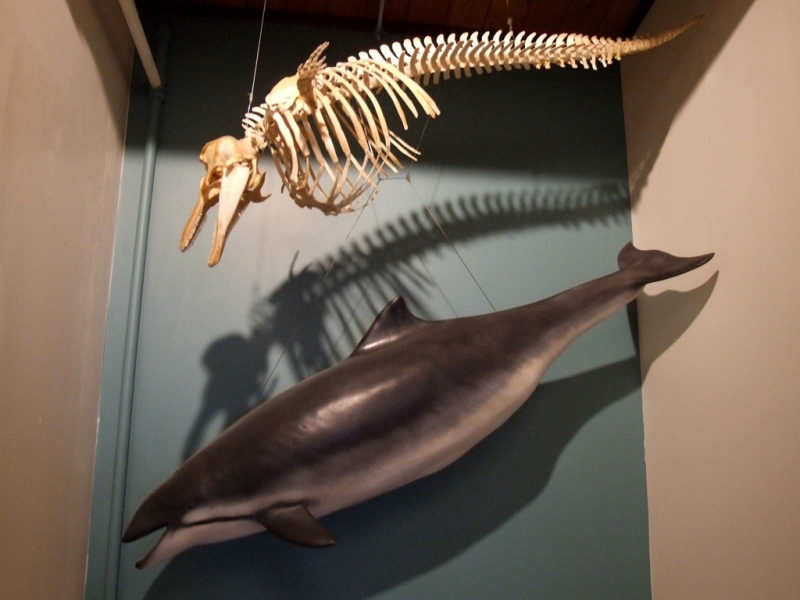 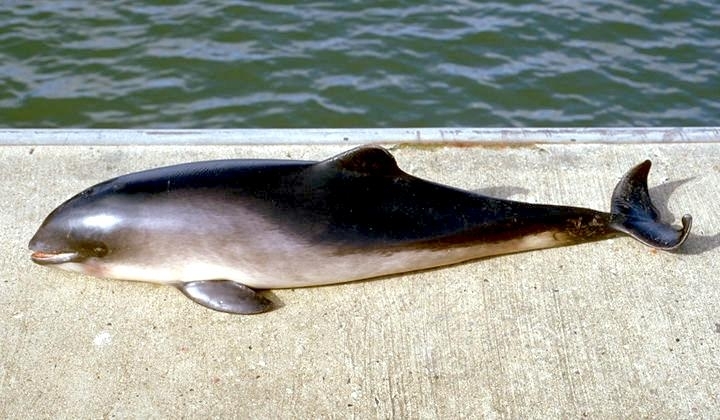 Harbor Porpoises are small cetaceans with a rotund, stocky body that tapers toward the tail-stock. 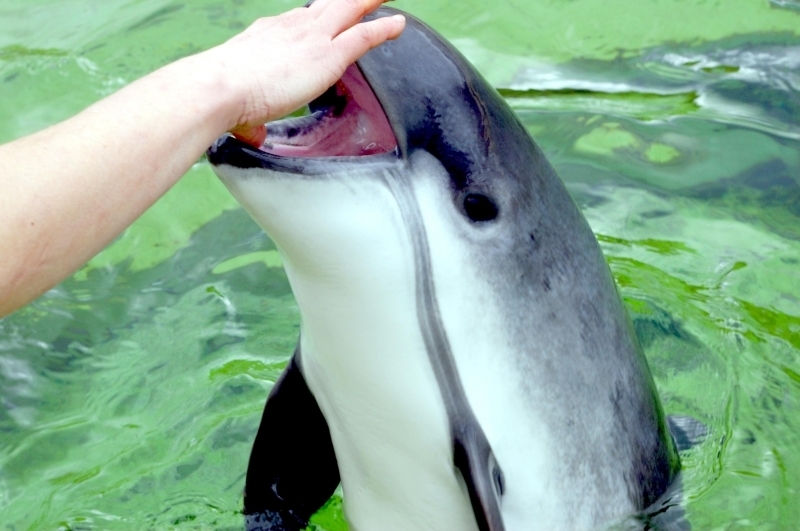 This porpoise reaches a maximum length of 1.9 meters and maximum weight of 90 kilograms. 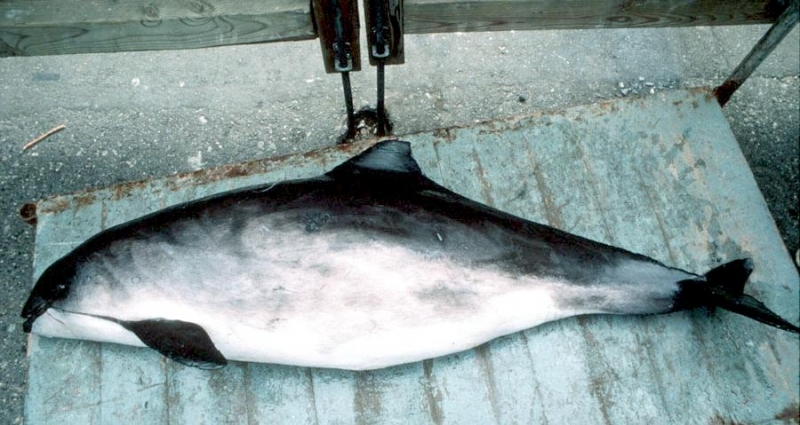 On average, Harbor Porpoises are smaller and do not exceed 1.5 meters or weigh more than 60 kilograms. 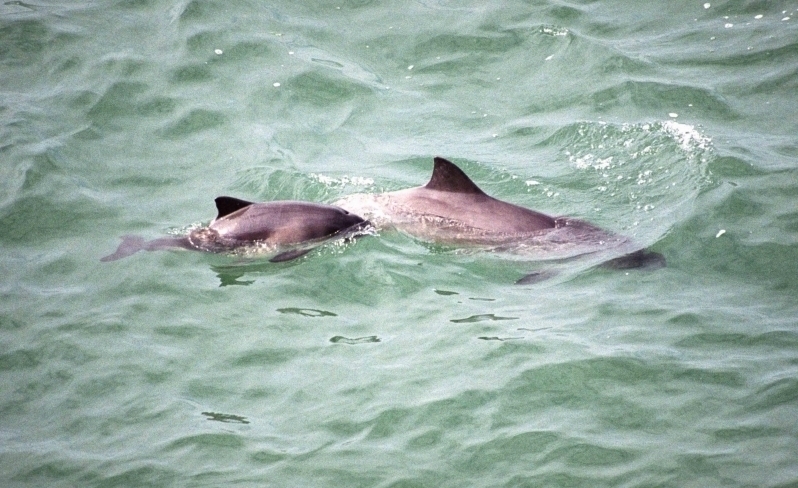 The females are slightly larger than the males. 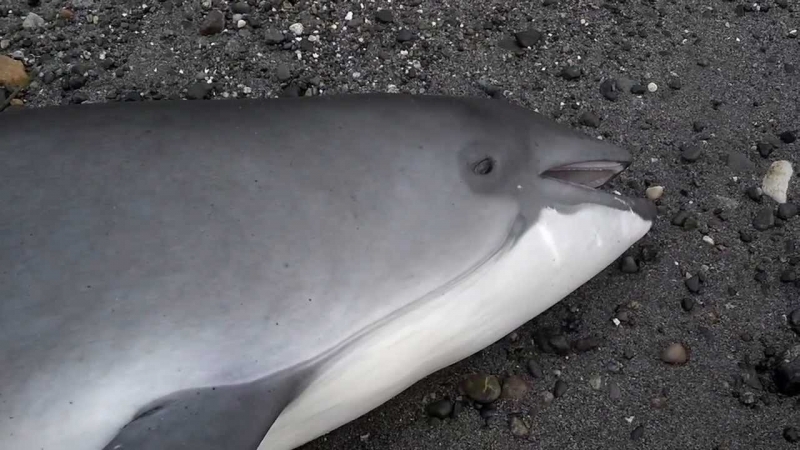 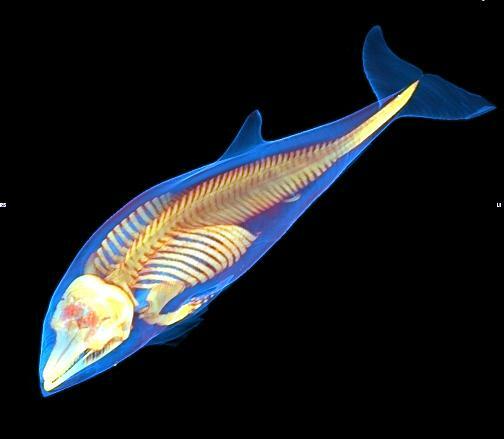 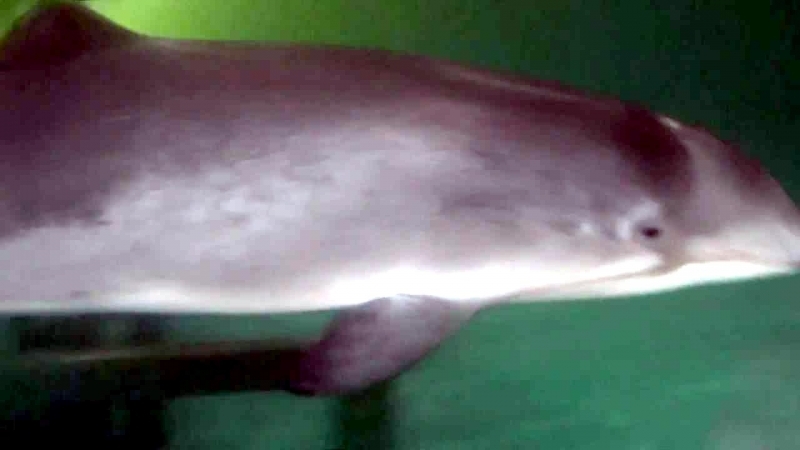 This porpoise has no beak but a blunt, rounded snout is present. 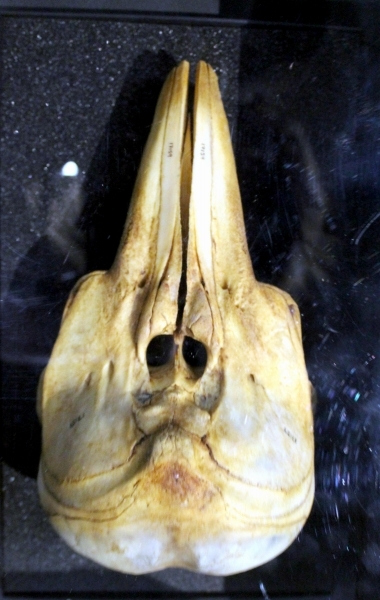 There are 22-28 small, spade-shaped teeth on each side of the upper jaw and 22-26 on each side of the lower jaw. 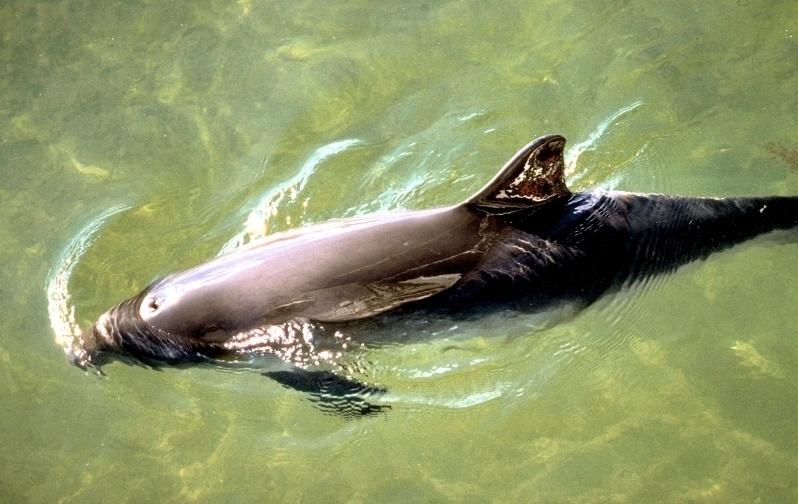 Harbor Porpoises are dark gray or dark brown on their dorsal (upper) sides, lighter gray on their flanks and white on their ventral (under) sides. 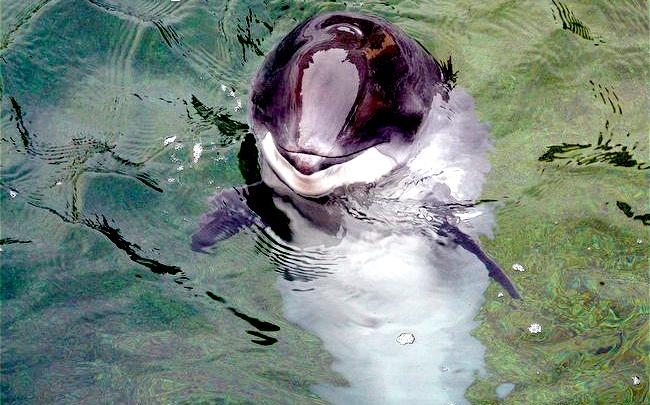 Their flippers are also dark in color with a dark stripe that extends to their eyes. Their flippers are small, oval and rounded at their tips. 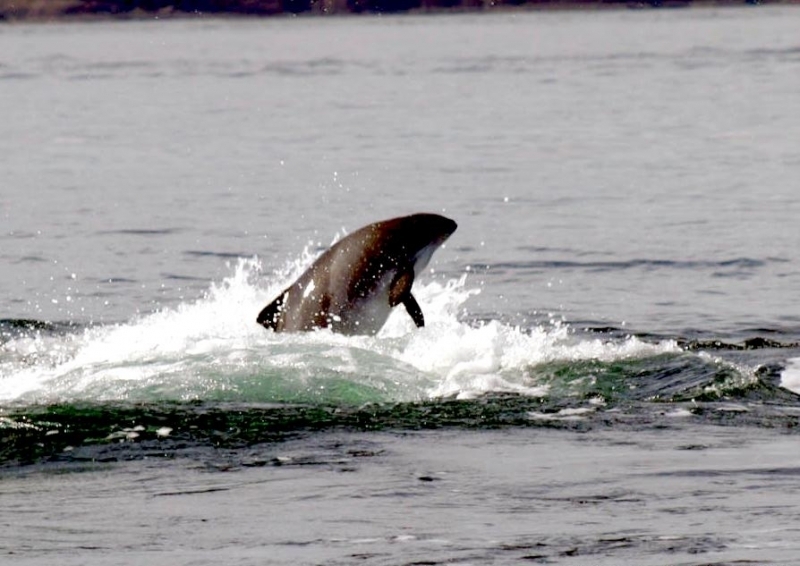 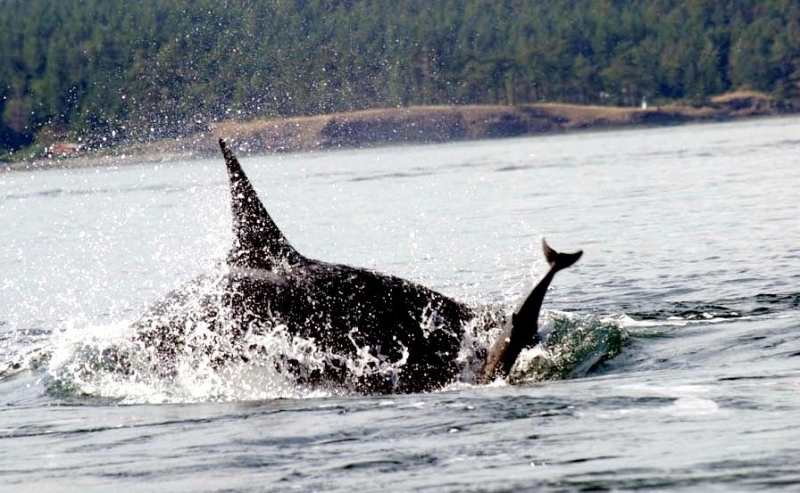 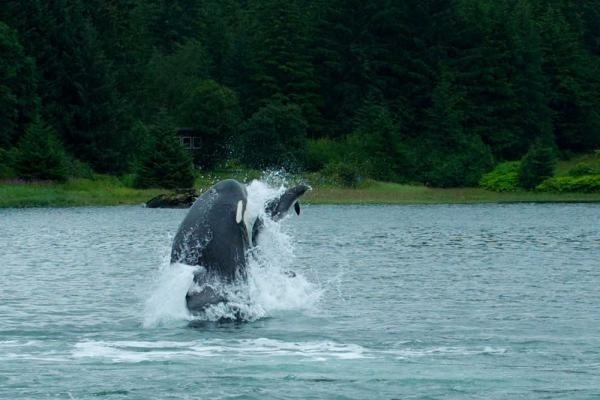 Their low, wide dorsal fin is triangular in shape and located slightly behind the center of their body. 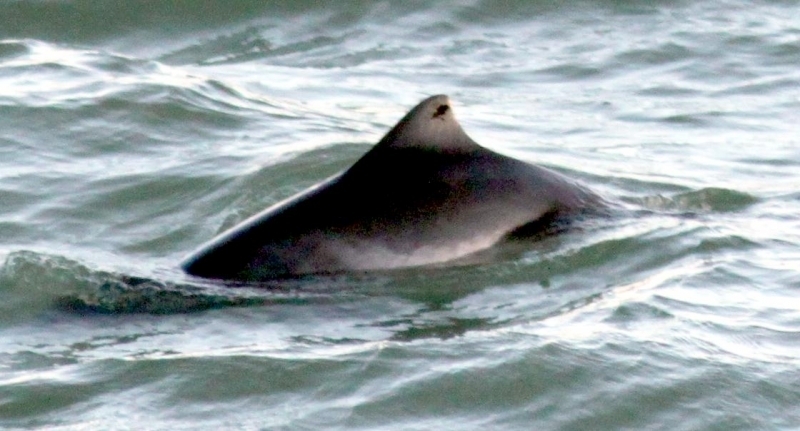 In some individuals, small nodules are found on the leading edge of their dorsal fin. 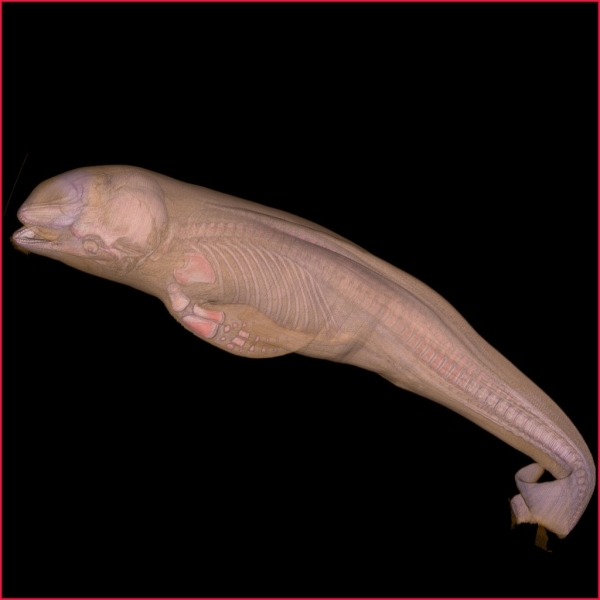 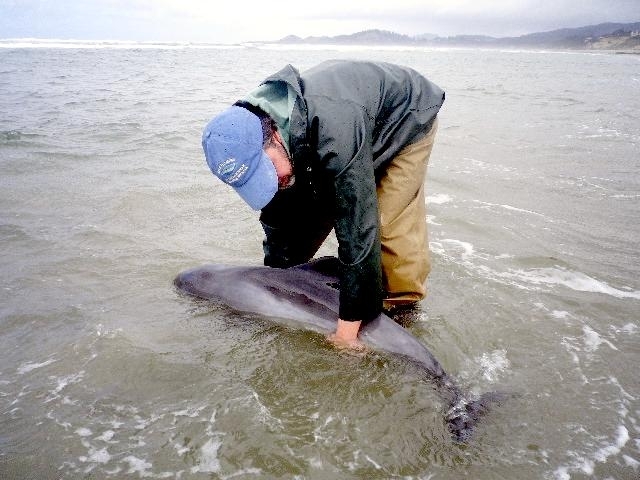 Their flukes (tail fins) are small & curved and have a median notch. 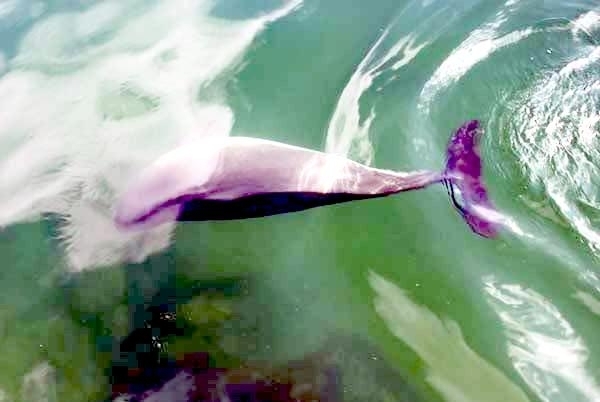 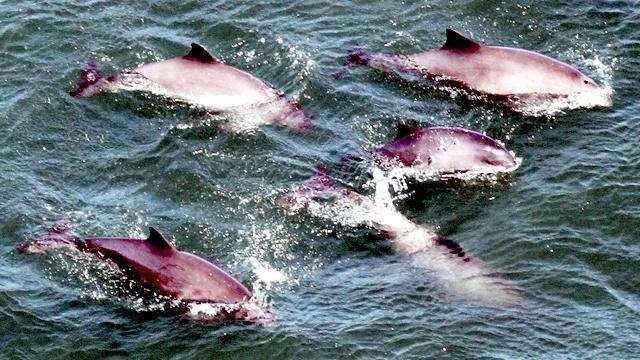 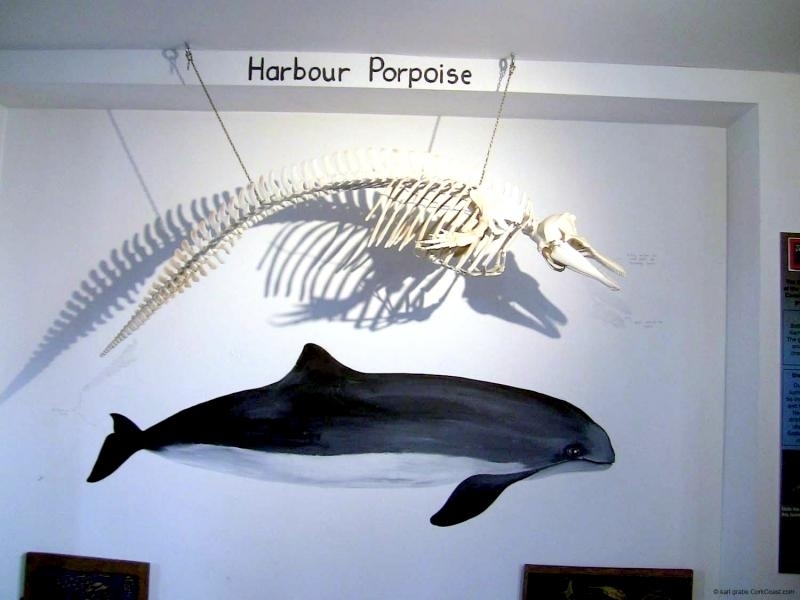 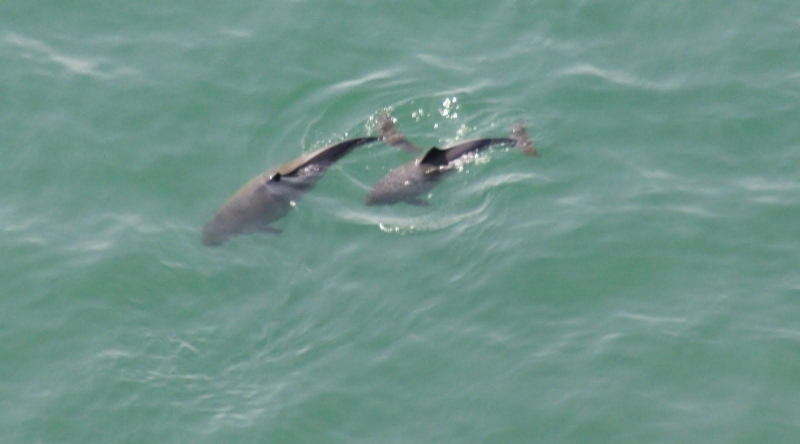 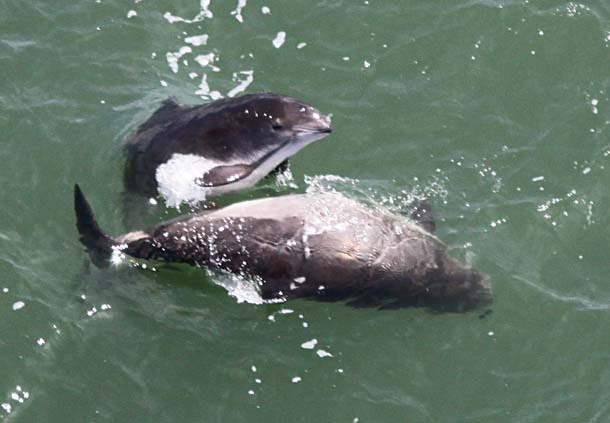 Harbor Porpoises are found singly, in pairs or in small pods of 6-10 animals however larger pods between 50-100 animals have been observed feeding. 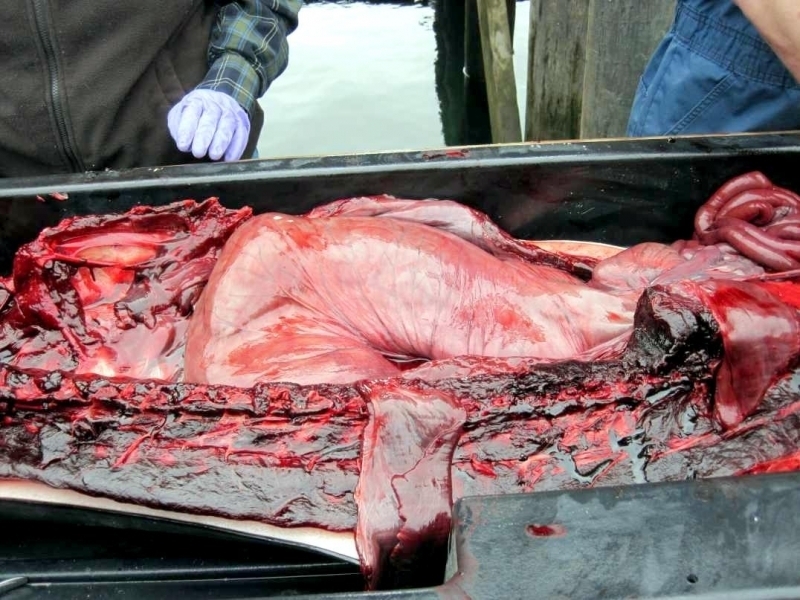 Their name is derived from the Latin word for pig (porcus) and are sometimes called “puffing pigs”. 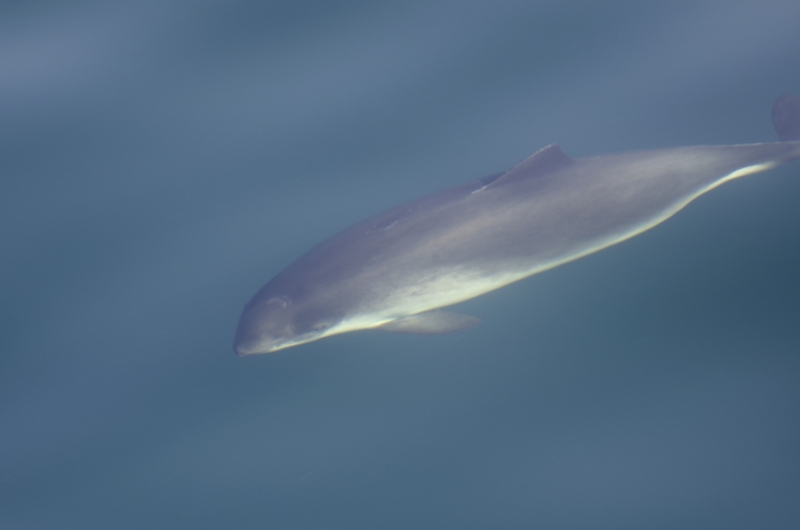 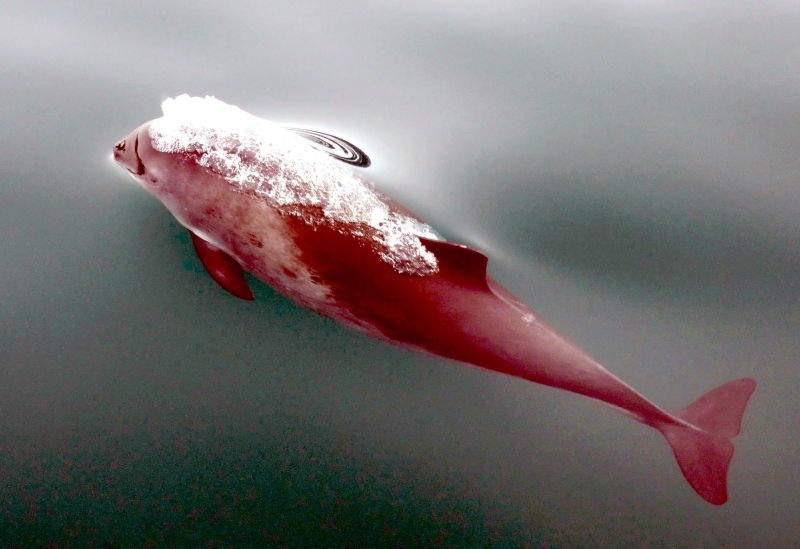 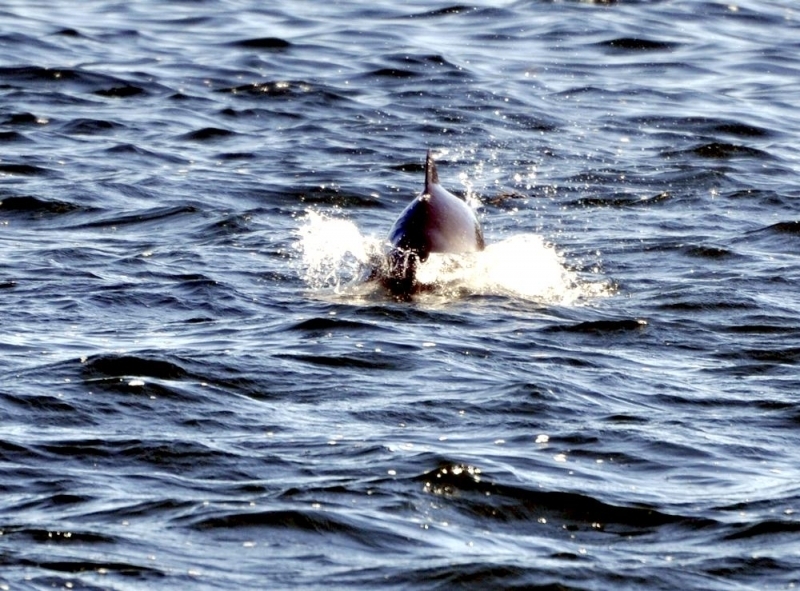 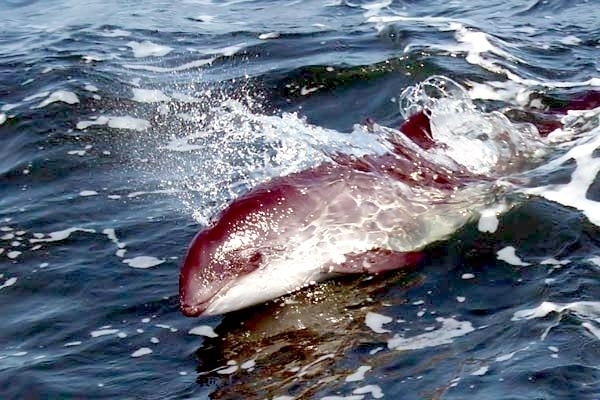 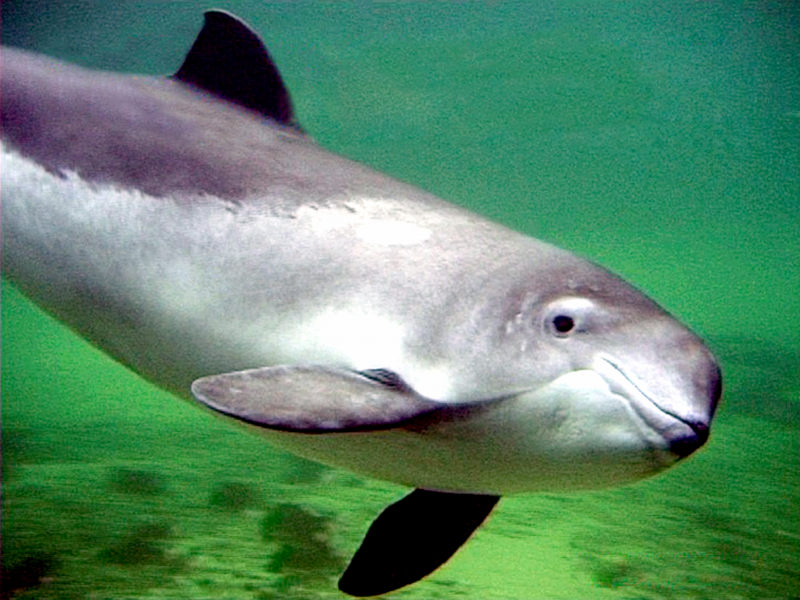 Harbor Porpoises are most commonly found in bays, estuaries, harbors and fjords. 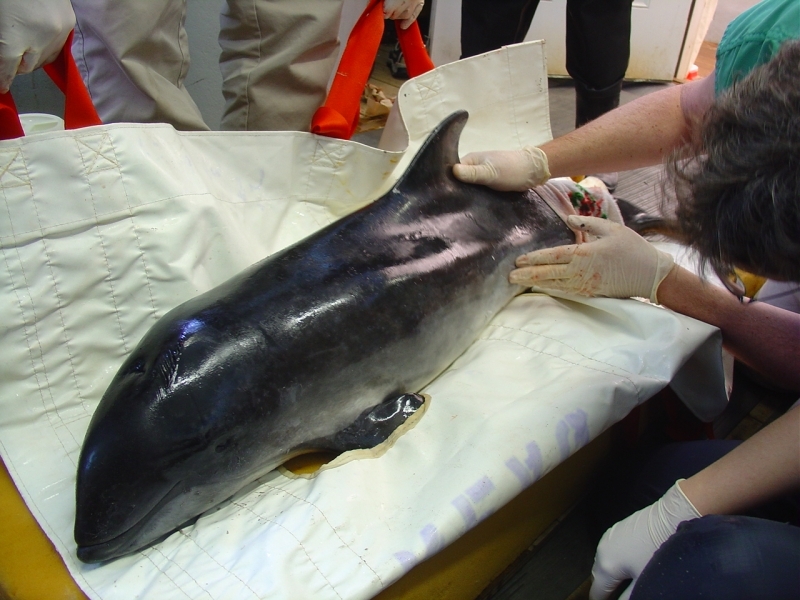 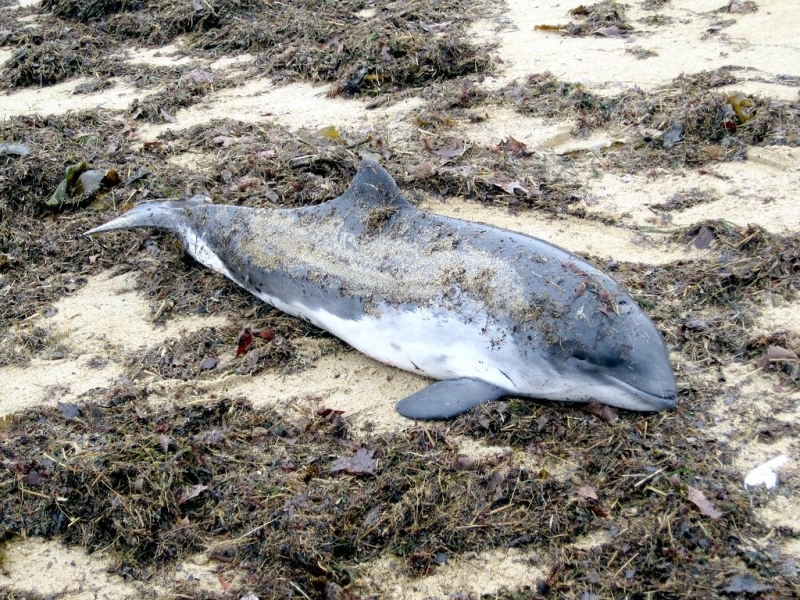 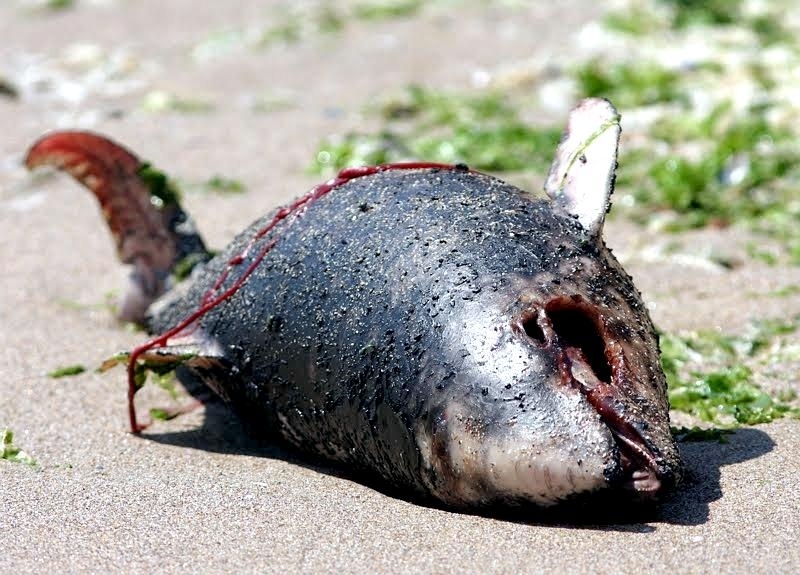 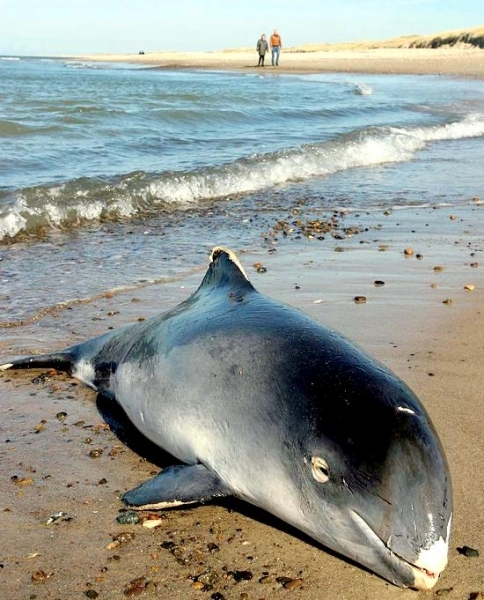 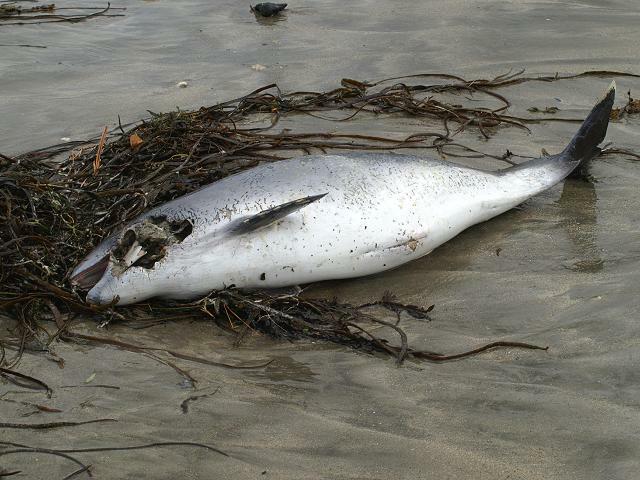 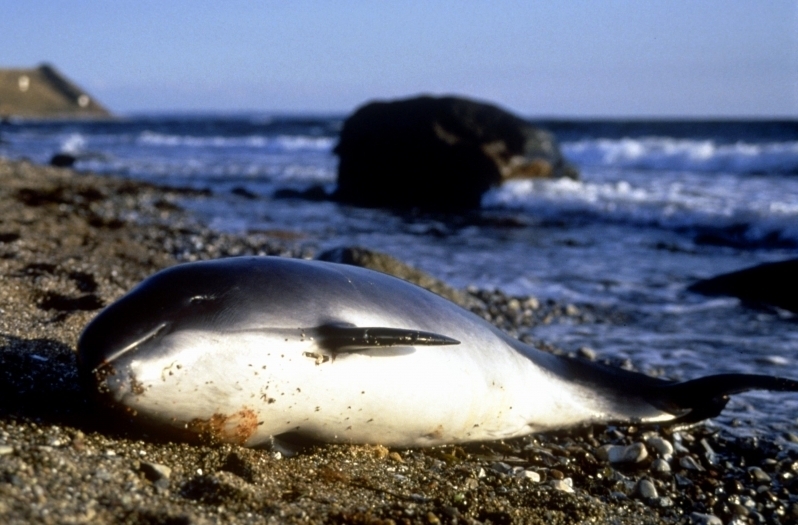 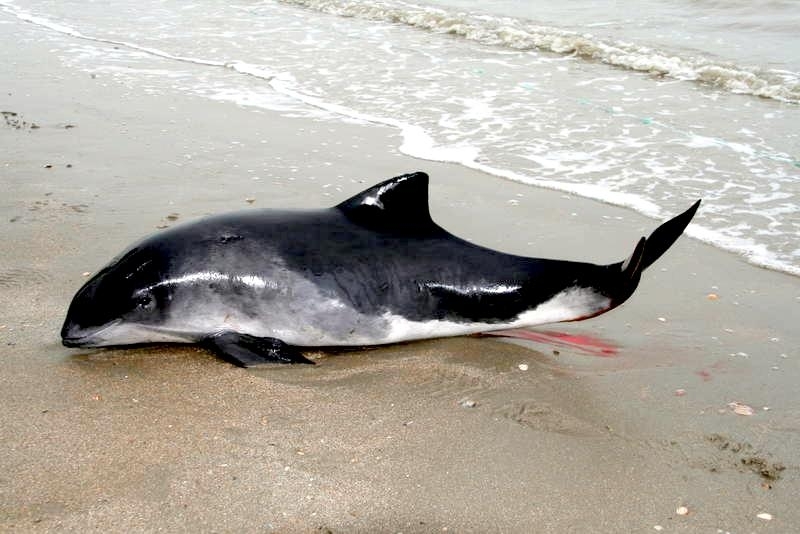 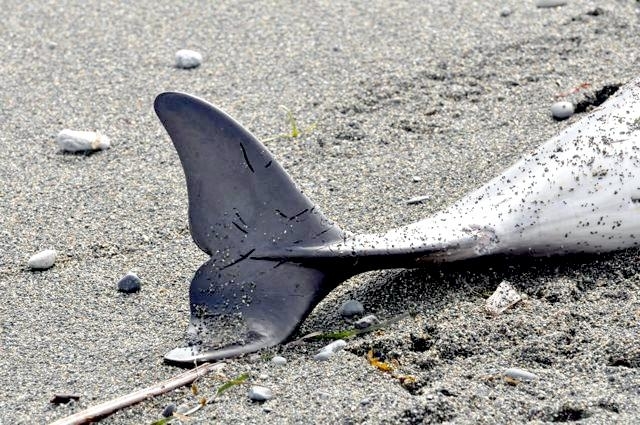 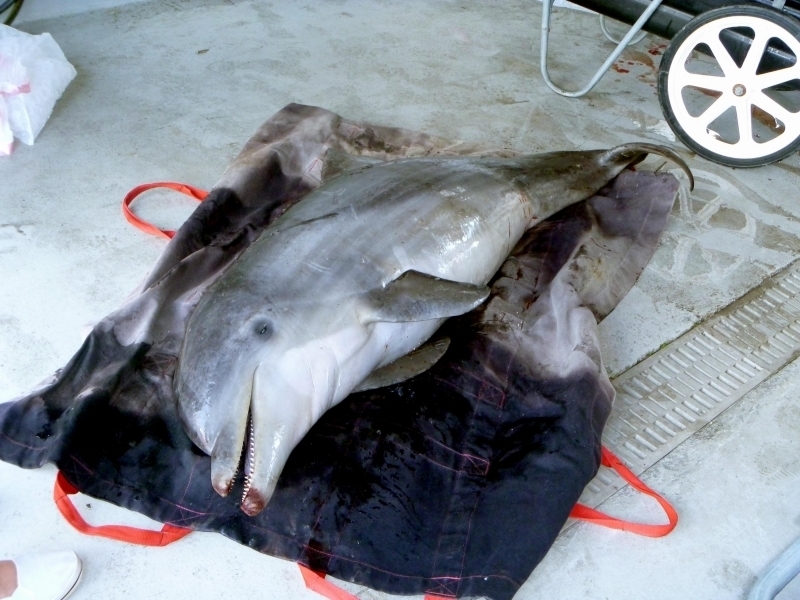 Harbor Porpoises are often found stranded, which is likely due to their preferred shoreline habitat. 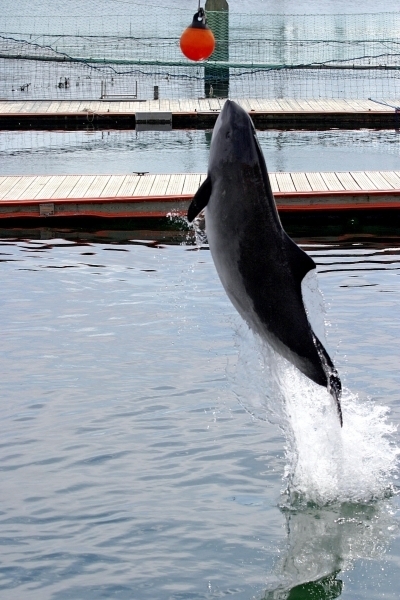 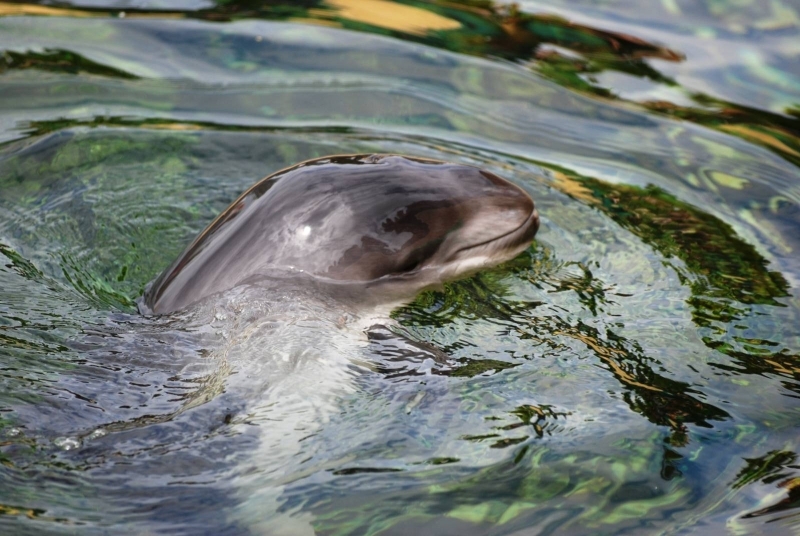 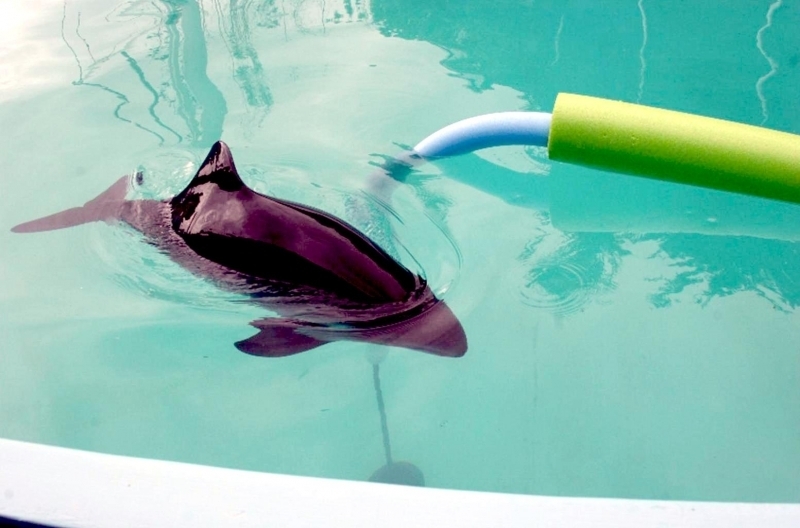 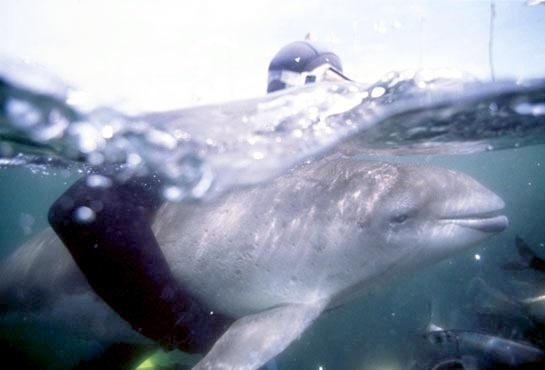 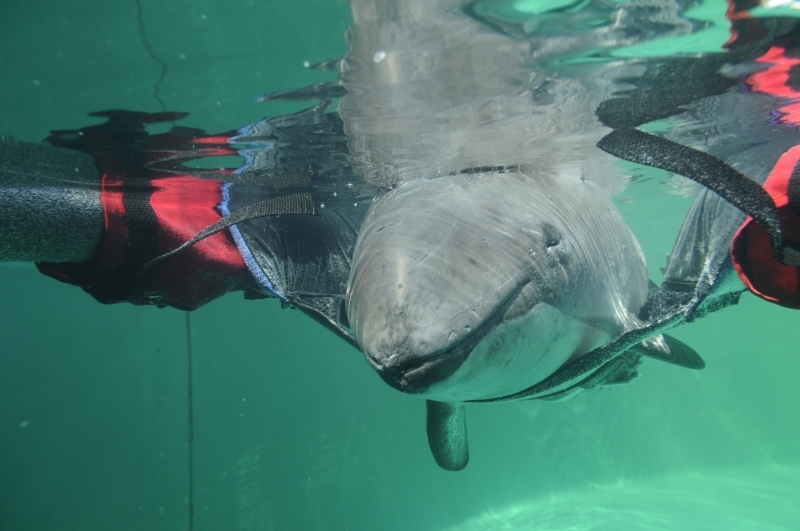 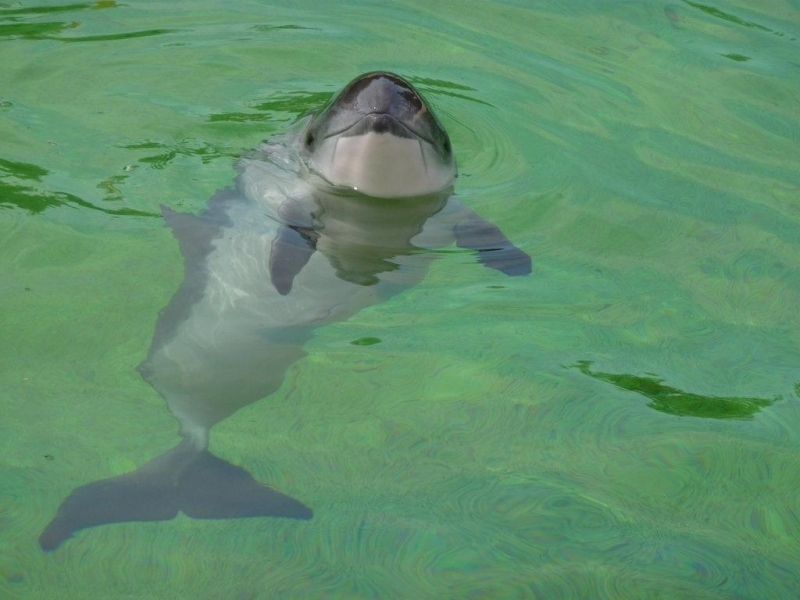 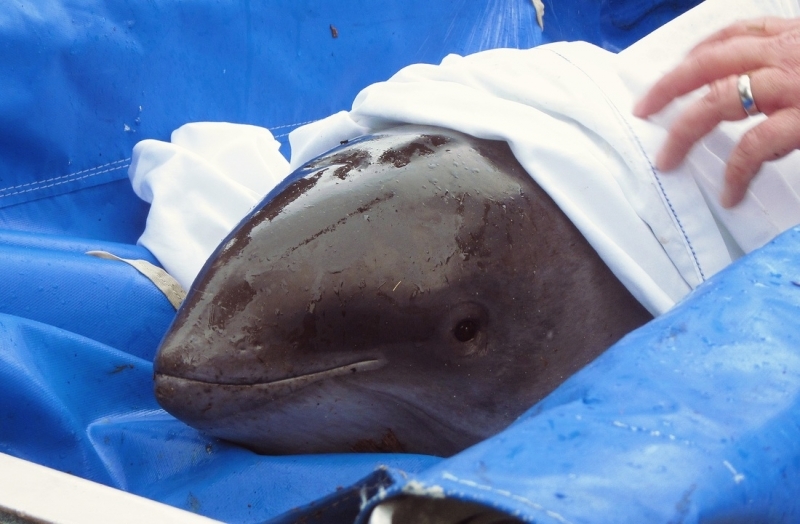 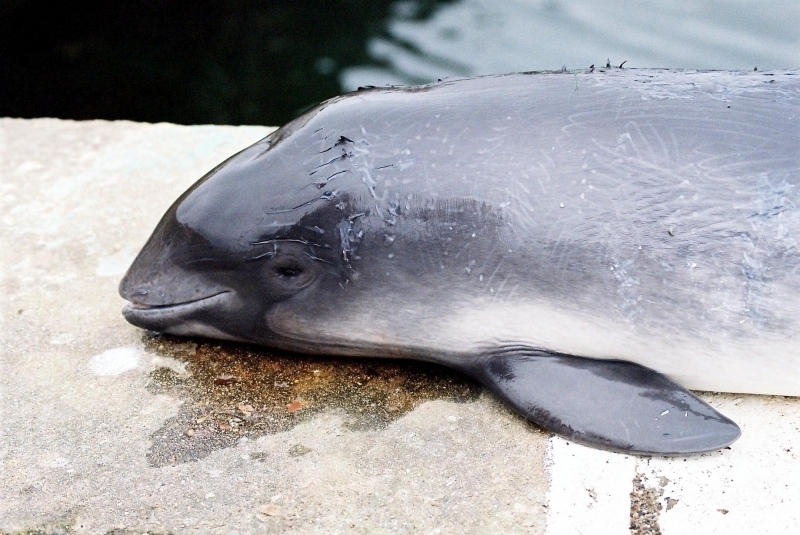 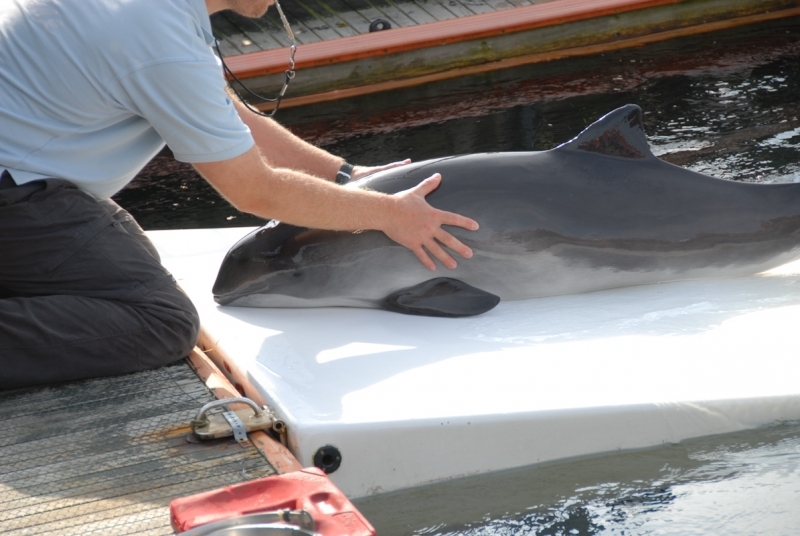 Although some live-stranded porpoises have been taken to aquariums, very few survived in captivity. 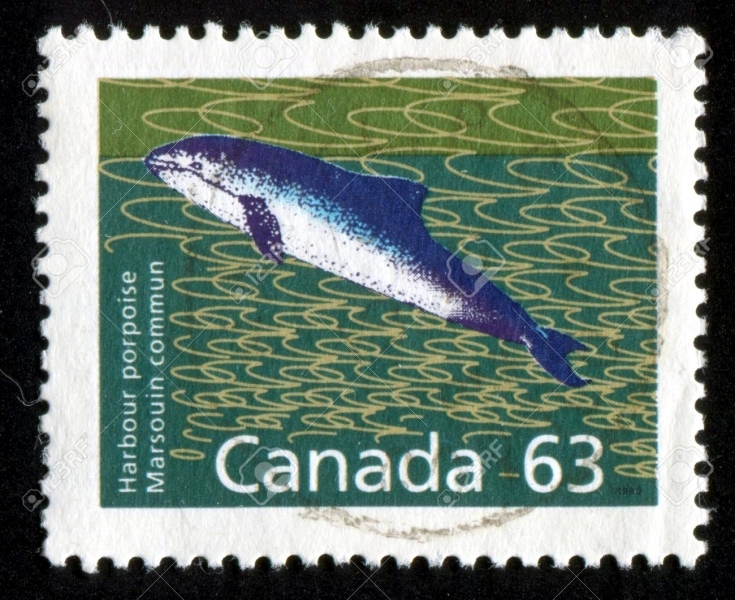 This porpoise is a non-gregarious species that shies away from boats. 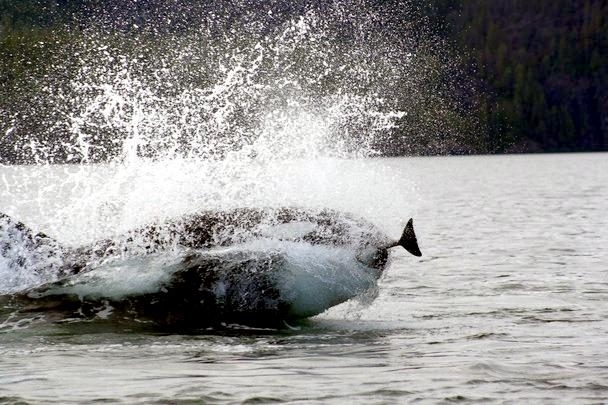 They are often detected by the loud puffing sound they make as they surface to breathe. 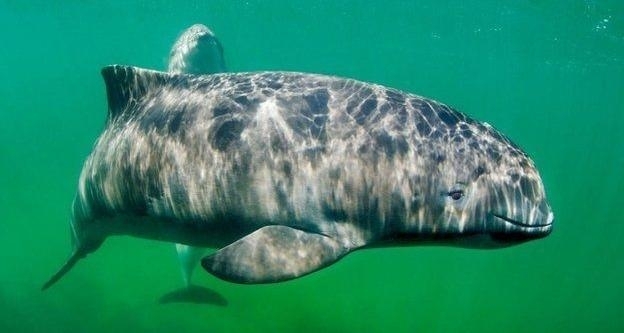 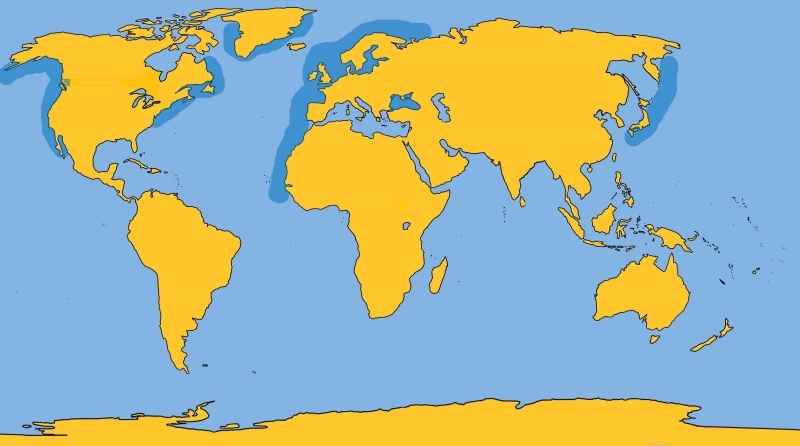 Harbor Porpoises are found in shallow, coastal waters of the North Atlantic Ocean, North Pacific Ocean and the Black Sea in temperate & subarctic waters of less than 15 °C. 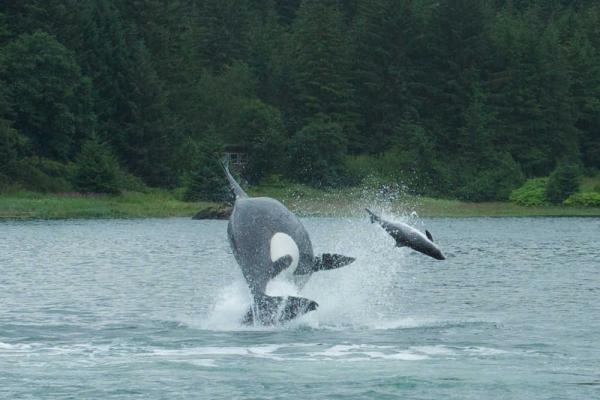 They sometimes also swim into bays and large rivers. 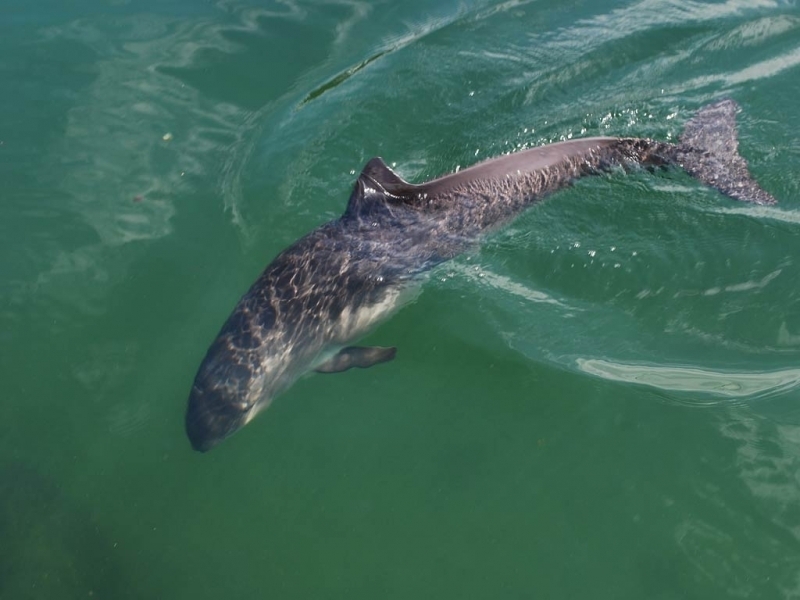 They feed on cod, herring, pollock, sardines, whiting and squid. 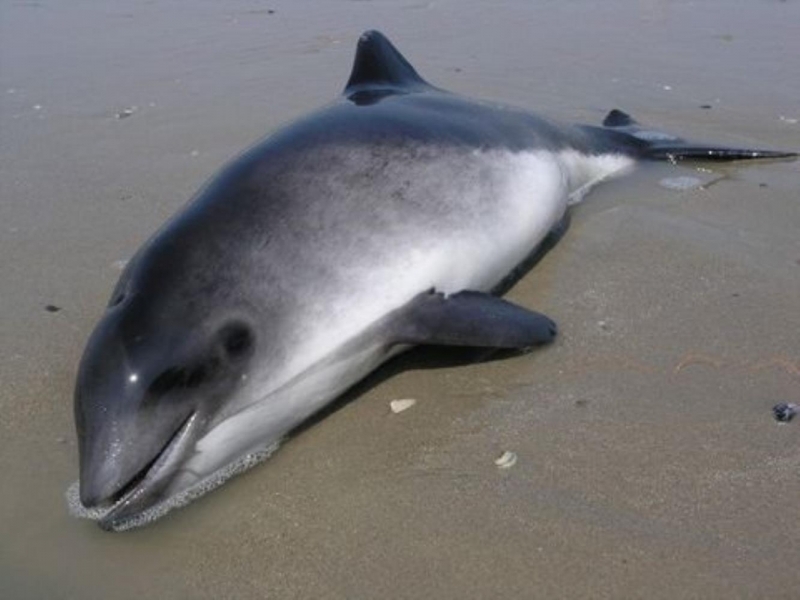 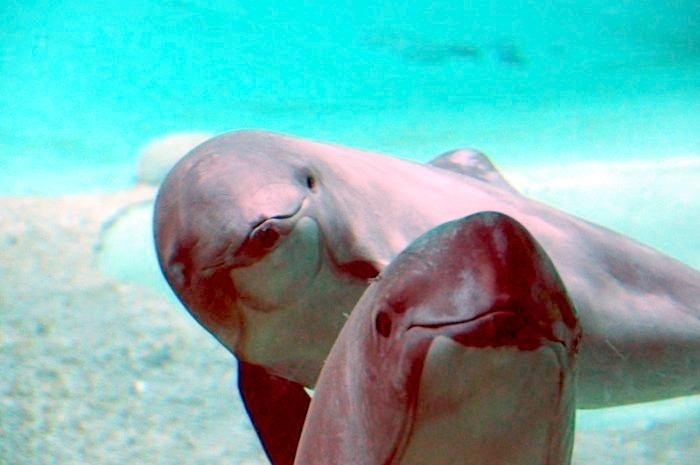 These porpoises consume about 10% of their body weight each day. 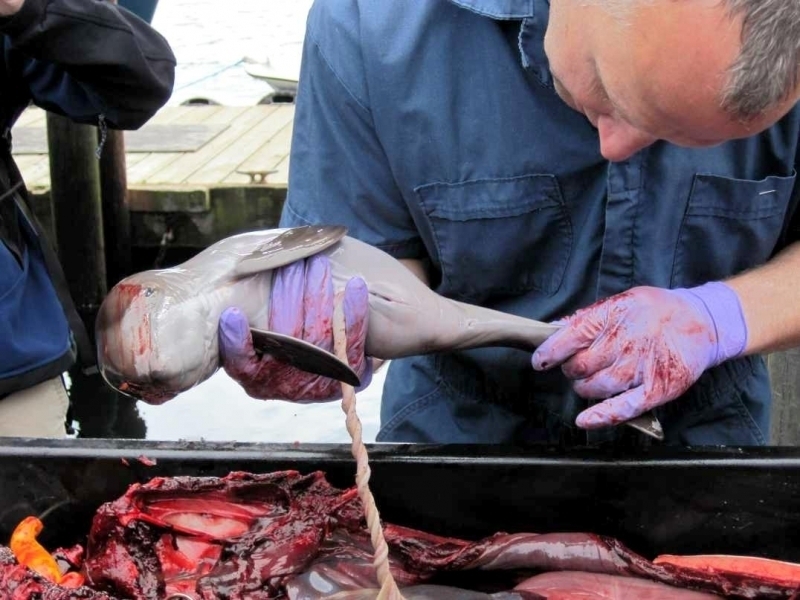 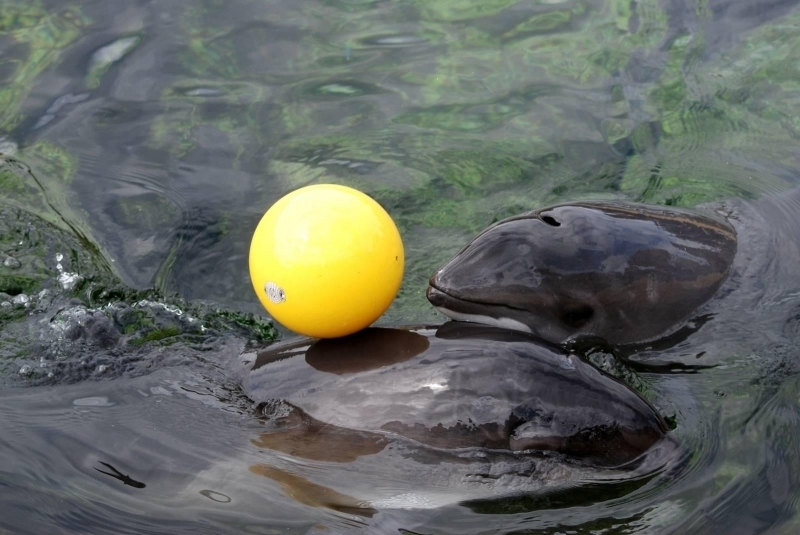 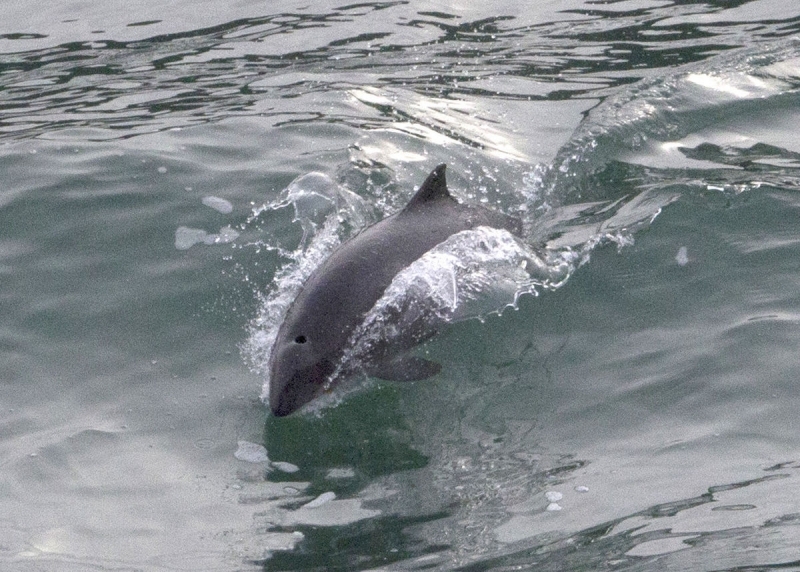 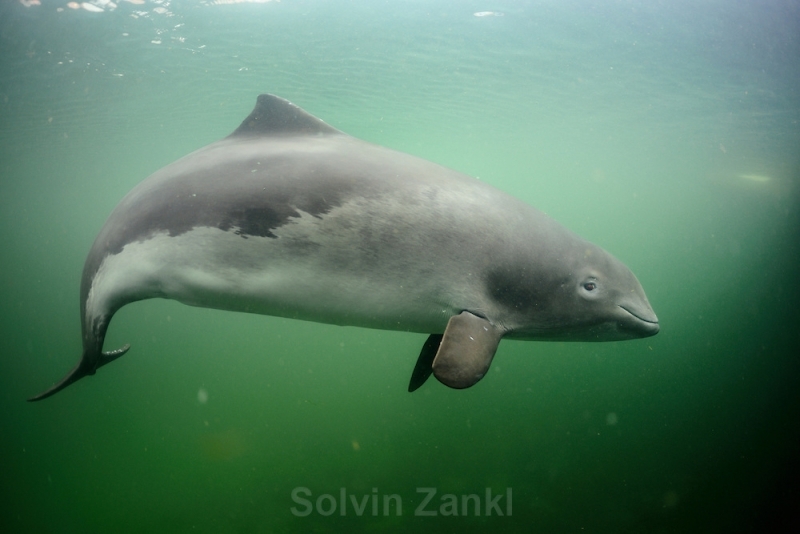 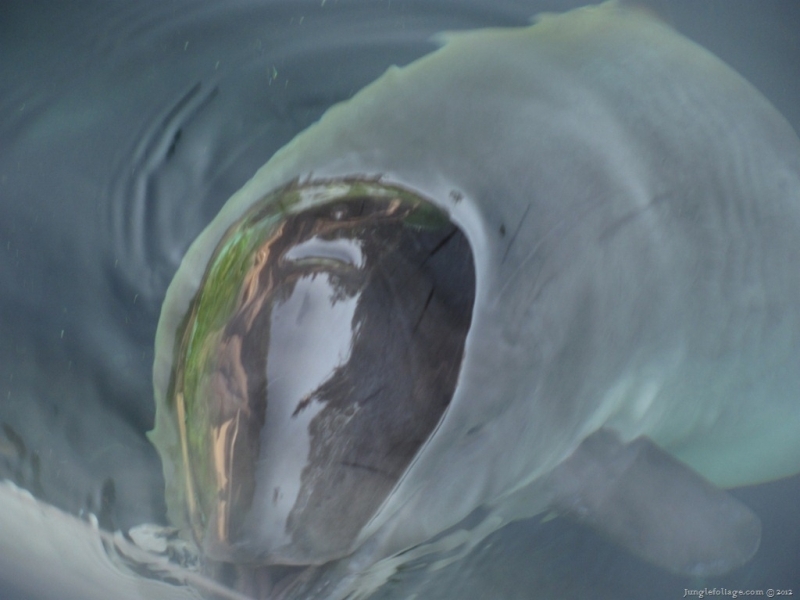 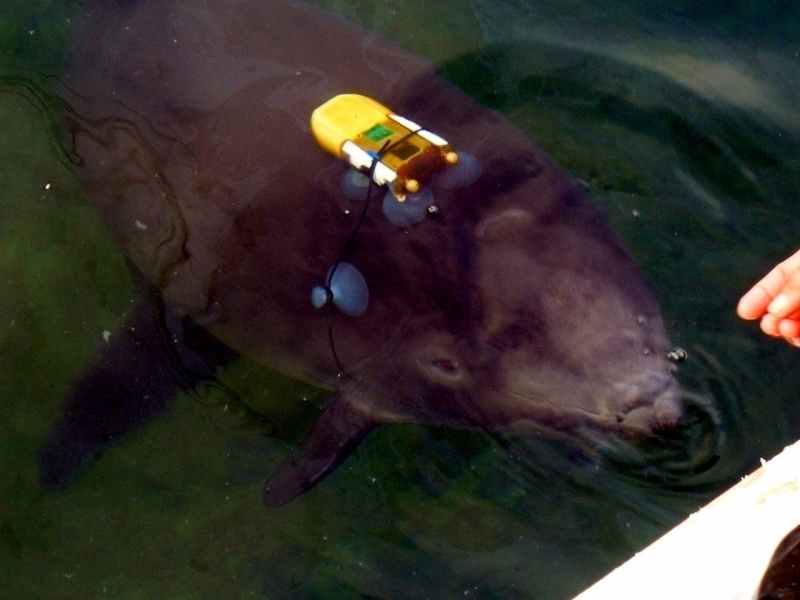 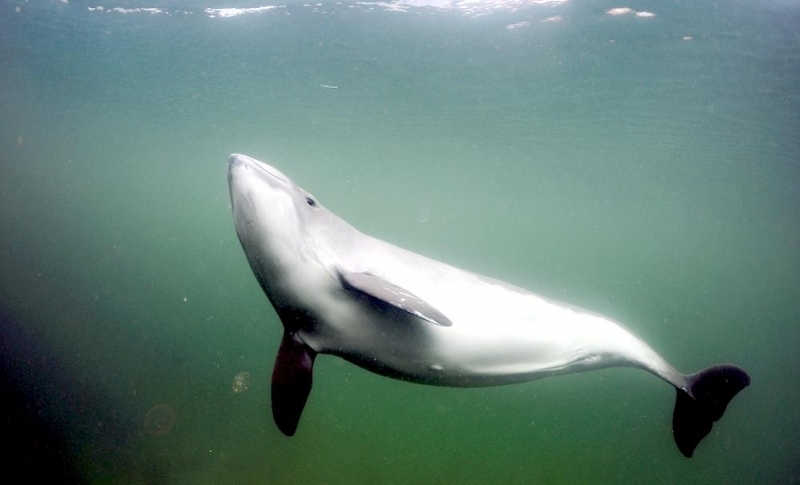 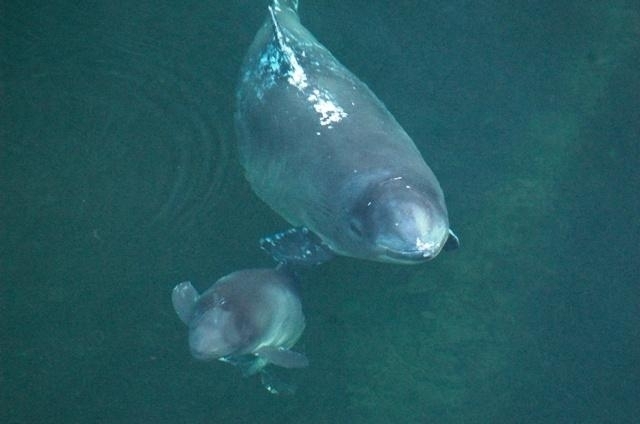 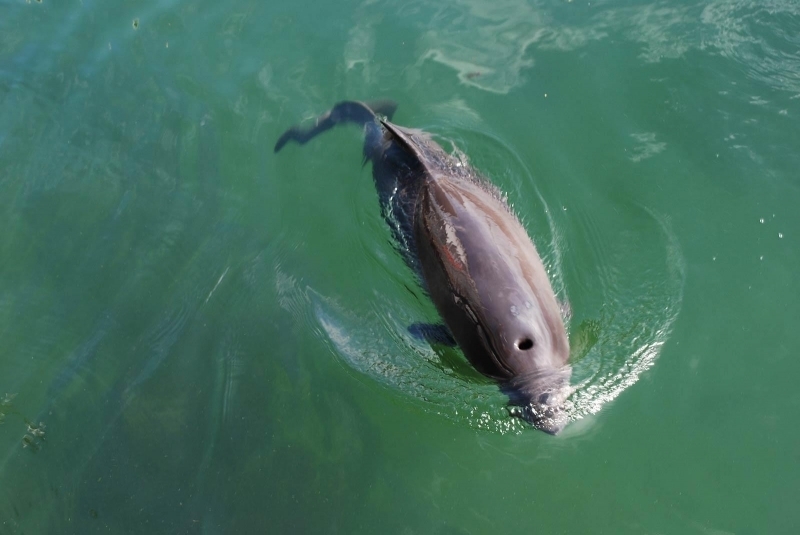 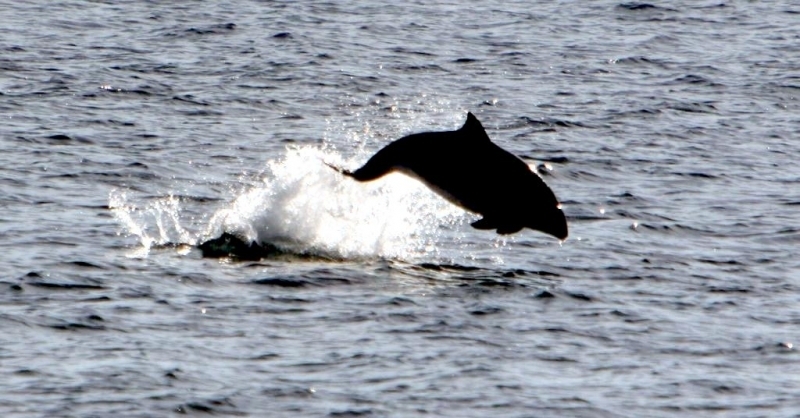 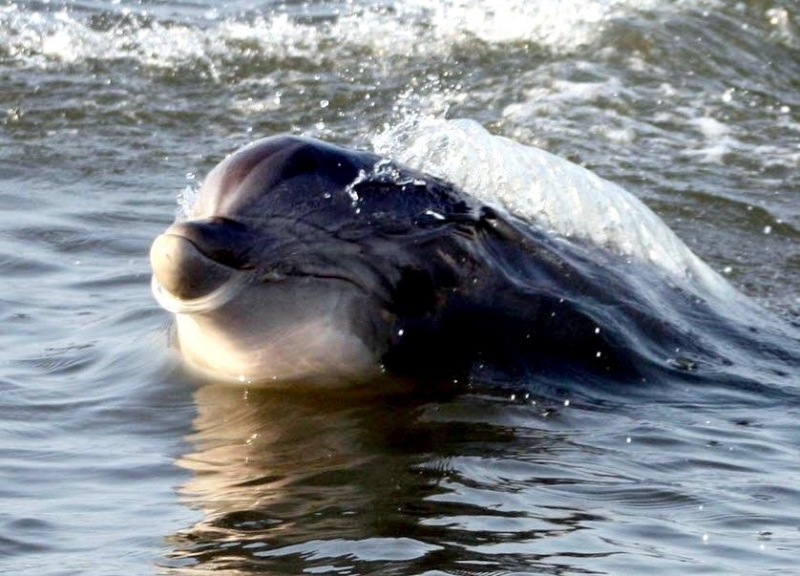 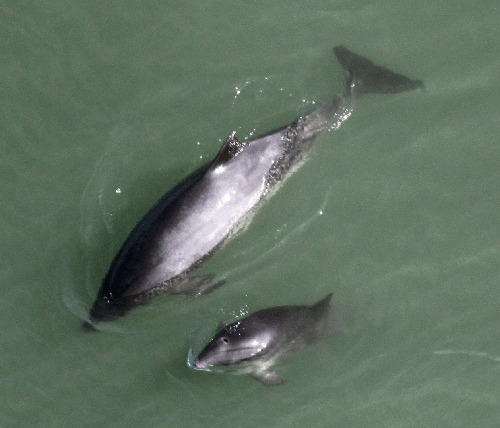 Harbor Porpoises reach sexual maturity at 3-4 years. 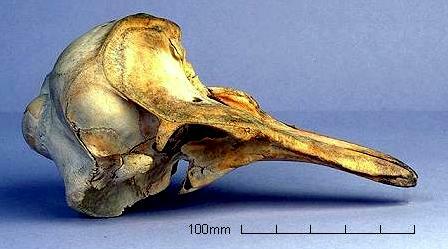 Calves are born 70-90 centimeters in length 6.4-10 kilograms in weight following a gestation period (pregnancy) of about 11 months. 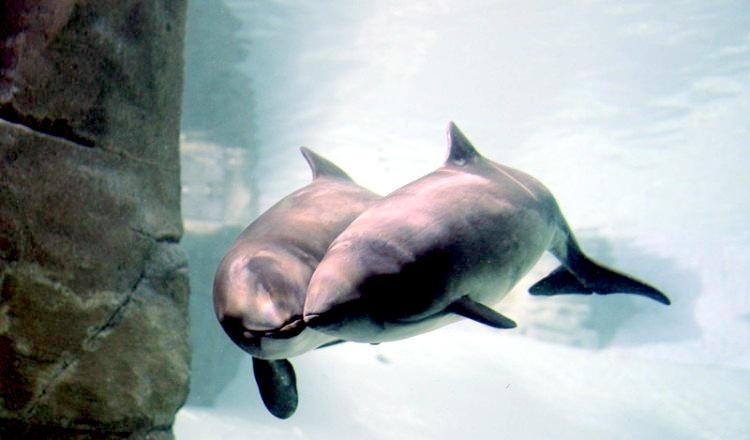 Females give birth about every 2 years and nurse for about 8 months. 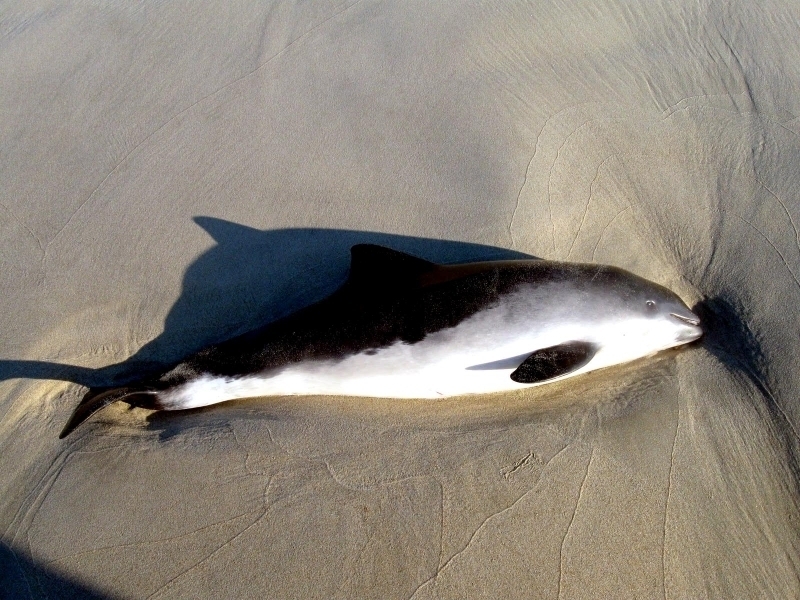 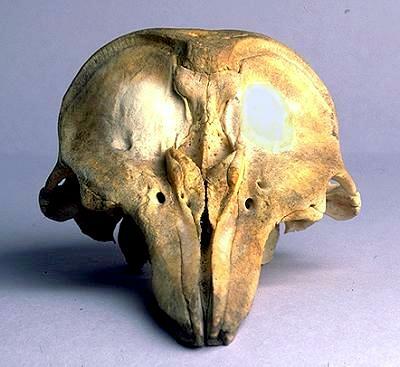 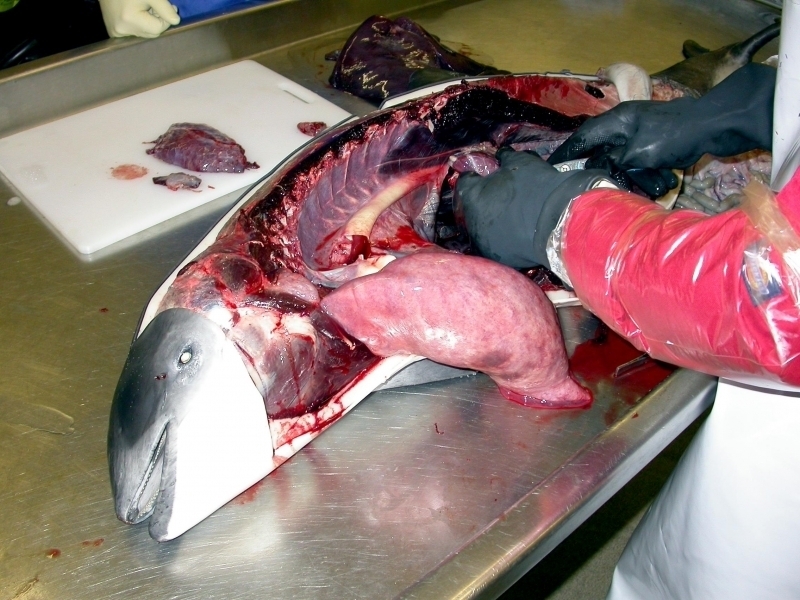 Because of their near shore habitat, Harbor Porpoises have been widely hunted by humans for their oil & meat. 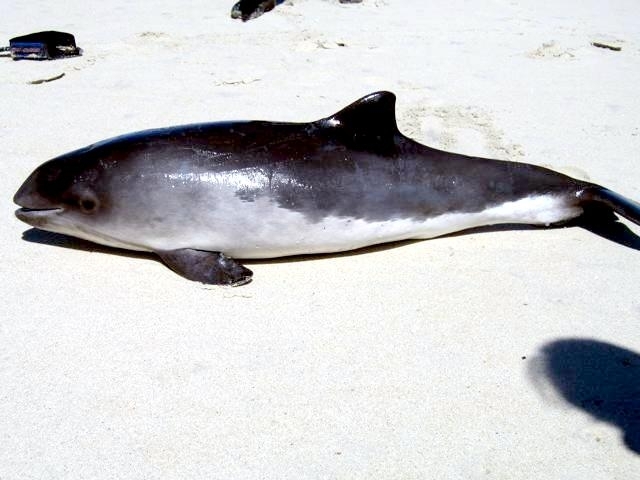 Although they are still abundant throughout their range, populations have declined. 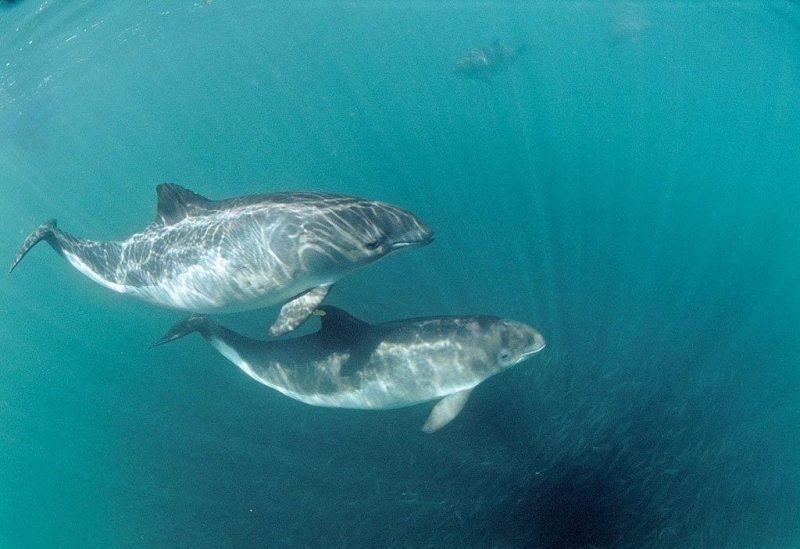 They are at-risk of entanglement in salmon & cod nets in the eastern North Atlantic and in trawl and gill nets in the Pacific. 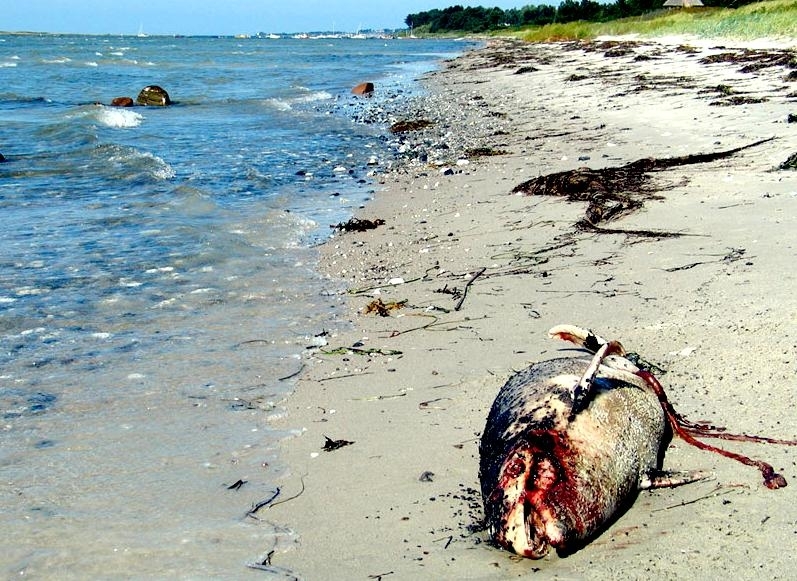 In the Baltic & Black Seas, populations have declined due to fisheries. 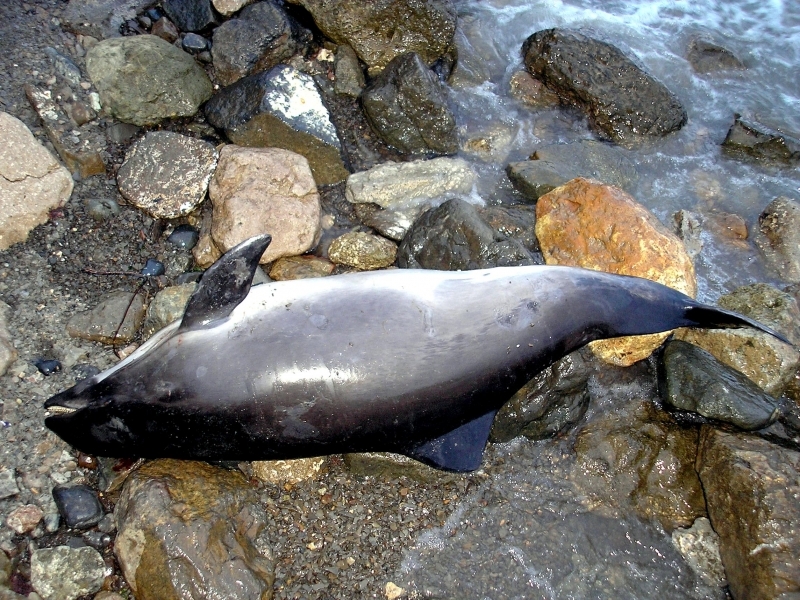 Harbor Porpoises are also at-risk of pollution from pesticides, destruction of habitat by coastal development and marine traffic.